The wrath of Mother Nature has been felt in many parts of the world recently. 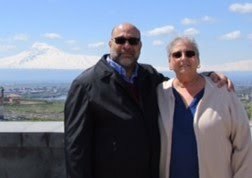 Sadly, wild fires, earthquakes, hurricanes and floods have ravaged numerous areas and have affected millions of people. Farmland and crops haven't been spared, either. The loss of precious fruits and vegetables is affecting their availability and forcing food prices to sky-rocket. The Florida avocado is one such crop. It'll be in limited supply for a while, but thankfully, other avocado-producing countries not affected by the weather, will help fill the demand – at a higher price, of course. Despite it all, I will share an avocado-based recipe that I hope you’ll find worthwhile no matter the price of this Heavenly fruit! 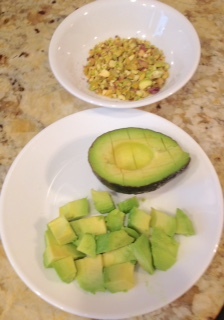 Peel avocado; remove seed. Cut avocado into small cubes. 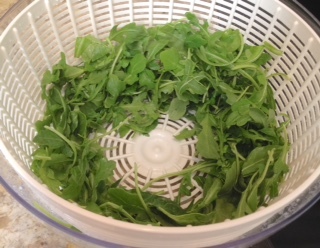 Place arugula in salad bowl. 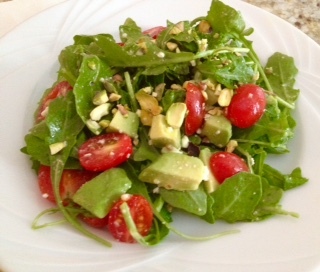 Top with remaining ingredients – except dressing and pistachios. Pour 1/4 cup dressing over salad; toss to coat. Garnish with chopped pistachios. Serve immediately. NOTE: If you're a fan of fresh cilantro, add 1/4 cup finely chopped cilantro leaves to the dressing.